Spent Saturday morning at the Golden Retriever of Greater Toronto's health clearance clinic. 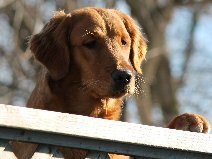 Pretty much every breed of dog has some form of genetic health disorder and Golden Retrievers are no different. We work very hard to make sure that our puppies are as healthy as they can possibly be. We check every one of our breeding dogs for orthopedic disorders like hip dysplasia and elbow dysplasia. We also check for eye, thyroid and heart conditions before they enter our breeding program. Doing all these clearances greatly increases the odds of healthy puppies, free of the inherited diseases that are common in our breed. I'm pleased to say that Crispin passed her eye and heart exams with flying colours. She's too young yet to have her hips and elbows checked, but once she turns 2, we'll do that. Ranger passed his eye, heart, hip and elbow exams as well. We also met up with Wendy and Bill who own a couple of our Rowan/Leia puppies from the December 2010 litter. Wendy owns Reba and Bill owns Bella. Both girls were checked for eye, heart, hip and elbow disease and also passed without issue. And you'll read more about that later.